Coverage: Watch live on BBC One, BBC One HD, online, tablets, mobiles and BBC Sport app from 1630 GMT; listen on BBC Radio 5 Live; text commentary on BBC Sport website. 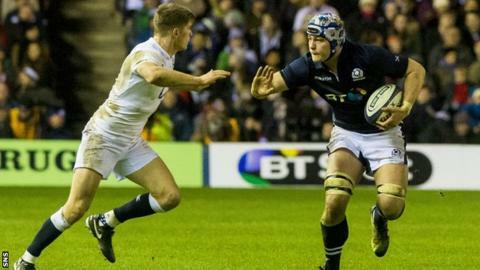 David Denton says Scotland's players are determined to repay the faith shown in them by head coach Vern Cotter when they take on Wales on Saturday. The Kiwi has made just one change to the team beaten by England, with Duncan Taylor in for the injured Matt Scott. Denton is "pretty certain" they will take their good training into the game. "We want to repay Vern for his faith in us but also to repay ourselves for the work we've put in over the last six months," the 26-year-old said. "It's challenging, coming in having not had a lot of time together before your first game," added the Bath forward. "But because we've had a bit of consistency with this team and we've been together for a fair amount of time now we're starting to get back into the swing of things quite quickly in terms of the training that we are doing." Wales opened their championship with a 16-16 draw against Ireland in Dublin on Sunday, the day after the Scots lost the Calcutta Cup match. And number eight Denton feels Scotland - quarter-finalists in last year's World Cup but without a Six Nations win in two years - need "to prove we are the team we think we are". "We are a confident bunch of guys and we've set our targets very high for this Six Nations," he added. "We're by no means out of this competition. We've lost one game. It was at home, which was a big loss for us. "We never want to lose at home, but now we have an opportunity to play one of the top sides in Europe on their home patch and hopefully beat them. "We don't want to be that team that's being courageous losers and all those kind of things that we've done in the past. "It's 'win no matter what' for us and we are going to do whatever it takes to get that."